UPDATED: The AOC Q3279VWFD8 aims to improve on the outgoing Q3279VWF’s limitations in imaging quality and responsiveness. This new model will retain the fantastic pricing of its predecessors while swapping out the VA panel for an IPS module that is presumably better in certain aspects. The AOC Q3279VWFD8 could be the next best all-around monitor for your productivity or gaming needs that offers reasonable performance in exchange for an equally reasonable price. The AOC Q3279VWFD8 incorporates a straightforward, minimalist design which suits a wider audience when it comes to aesthetic taste. 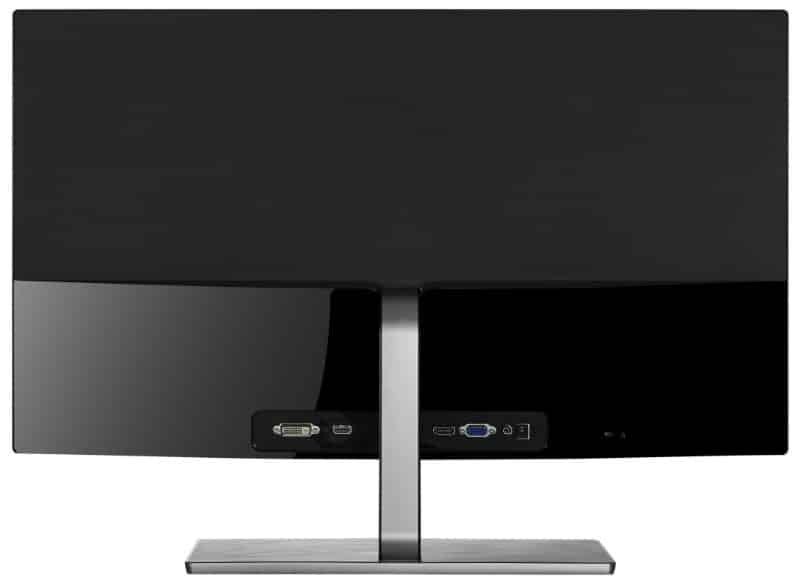 However, the simplicity of the design is also an obvious indicator of the monitor’s budget-oriented nature. The chassis comes with a glossy black finish which gives it a luxurious appeal while making it harder to maintain. There are virtually no changes in the appearance when compared to the AOC Q3279VWF meaning the AOC Q3279VWFD8 inherited the former’s modest proportions. The slim housing of the display makes it ideal for wall mounting. However, AOC did not redesign this new model to be compatible with aftermarket mounts. But those with small desks shouldn’t worry too much since the chassis itself with the stand will only consume six inches of depth. One of the things we dislike on budget monitors like the AOC Q3279VWFD8 is the inclusion of tilt-only stands. For most users, this adjustment is sufficient especially for monitors of this size, but we all want a bit more flexibility. It’s also notable that if you do get this product, you will have to live with the stand since it isn’t removable. The AOC Q3279VWFD8’s OSD can be accessed via pressable buttons under the bottom bezel. However, we still prefer joysticks or JOG buttons over typical layouts for ease of use. Hidden buttons like these take some getting used to, but we know most users usually leave them alone once a preferred setting is attained. Connectivity wise, the AOC Q3279VWFD8 doesn’t disappoint since its layout includes everything you will ever need. The panel consists of DisplayPort 1.2 and HDMI 2.0 for video inputs, plus a DVI-DL and D-Sub connector for older devices. However, cost-cutting omitted valuable features such as USB slots and a pair of inbuilt speakers. 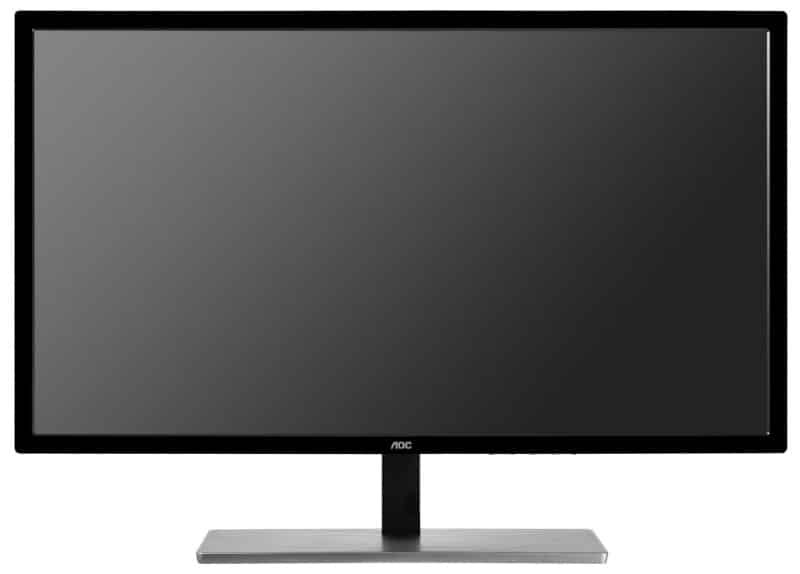 The AOC Q3279VWFD8 features a 32-inch IPS panel with a 2560 x 1440 QHD resolution, a 75Hz refresh rate, and 5ms typical response time. The module is backed by a 250cd/m2 WLED array and 1200:1 contrast ratio. The previous version made use of a VA panel which had more contrast but had slightly skewed color quality and accuracy. The is capable of 10-bit color via FRC, but it’s default profile and presets are imbalanced for every use. The AOC Q3279VWFD8 displays interesting results when it meets a colorimeter, starting with 100% sRGB and 89% Adobe RGB coverage. You only need to adjust color temps and brightness settings a bit to get a balanced and vibrant output from this product. The AOC Q3279VWFD8’s Gamma tracking is well-behaved at 2.2 all throughout, so you don’t need to worry about the images being washed out or too dark. The IPS panel is also able to reach a contrast of 1300:1 easily, providing inky blacks and rich vibrancy. Couple these numbers with the tweaked color temps and you get a pleasing setting that’s suitable even for basic photo editing. On the other hand, panel uniformity from the AOC Q3279VWFD8 displayed mixed results. The brightness of the panel looked almost even, but the corners are actually slightly darker by an average of 13%. For most cases, this isn’t noticeable, but staring at dark images may reveal the minimal discrepancies. Color uniformity, on the other hand, could use some improvements since the deviance is a bit more noticeable than the backlight variation. Games like Black Ops 4 looked perfectly vibrant, but when sceneries start losing lighting, the middle and upper quadrants look more saturated than the bottom. This won’t be an issue in changing frames, but you might notice the differences in static images. However, these issues could vary between unit to unit of the AOC Q3279VWFD8, especially since it’s based on IPS technology. We’ve seen worse leaking or bleeding from other models, especially the older variants. The IPS lottery rules apply, so make sure you have a flexible return policy for this budget monitor. The AOC Q3279VWFD8 handles motion decently, although you can expect blurs and trails since it has a limited refresh rate. Playing fast-paced games isn’t ideal, but we think this limitation is forgivable for the price. The device includes Overdrive settings in its OSD, but we recommend leaving it at off since any of the presets will add overshoot. As mentioned, the AOC Q3279VWFD8 can be pushed to produce 75Hz which is recommended to improve the pixel response time. You can create a custom resolution via Nvidia Control Panel or activate FreeSync with an AMD GPU. Take note that the former isn’t guaranteed since not all units will be able to overclock to 75Hz without FreeSync. But what has drastically improved in the AOC Q3279VWFD8 when compared to its predecessor is the input lag. The monitor’s latency does not exceed 4ms at its fastest, making this display viable for gaming on all platforms. The AOC Q3279VWFD8 is an excellent 1440p monitor for its price that sits at less than $300. The monitor is capable of fantastic color and accuracy with minor tweaking, along with excellent contrast and gamma right out of the box. The ability to push the screen to 75Hz and the low input lag sweetens the deal further for both PC and console gamers. The monitor’s physical features and its output’s flaws could use some improvements. The imbalance in the quadrants of the screen will disturb the meticulous, but for general use, it shouldn’t be an issue. The AOC Q3279VWFD8 is a fantastic buy if you are looking for a 1440p upgrade that won’t drain your pockets.